To start with, this review will include some slight spoilers for If I Stay. You have been warned. This book starts three years after the end of the first book, but instead of following Mia, it follows her boyfriend, Adam. Except . . . he’s not her boyfriend anymore. Mia survived, went to Julliard, and is now a rising star on the classical music scene. Adam and his band, Shooting Star, have made it big. Adam has fame and money, but he doesn’t have Mia. They didn’t even really break up, they just sort of drifted away from each other. Adam’s life has started going off the rails. He’s successful in every way, but he’s miserable at the same time. He never fully got over the fact that Mia is out of his life. He is angry, bitter, and generally unpleasant to be around. Shooting Star’s now platinum album, Collateral Damage, is full of songs that Adam wrote about his relationship with Mia and it’s painful for him to sing them any more. And then, a chance meeting in New York City. Mia is giving a concert there and Adam is stuck there waiting to head to London to start his tour. When they are finally face to face again after three years, there is an explosion of emotions. Love, hate, anger, adoration, passion, isolation. I really couldn’t get over how well this emotional roller coaster was portrayed. Adam and Mia’s feelings toward one another are confused and twisted by all the things they have gone through. It was fantastically written. 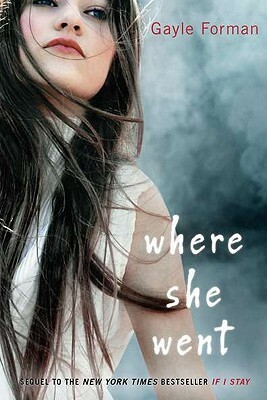 I have to say that I enjoyed Where She Went even better than If I Stay, and I was not expecting that. Both books are excellent though, and I can’t recommend them highly enough. Next Post I can has new phone!